Welcome to the latest edition of our Commodities newsletter. With record wheat volumes over the summer, Euronext (Matif) wheat has shown that it is firmly established as a benchmark for European wheat. This summer the daily record volume for our flagship Milling Wheat future contract was surpassed on 3 separate days with 2nd August seeing over 7.4 million tonnes change hands on our market, representing 5% of the EU annual wheat production. 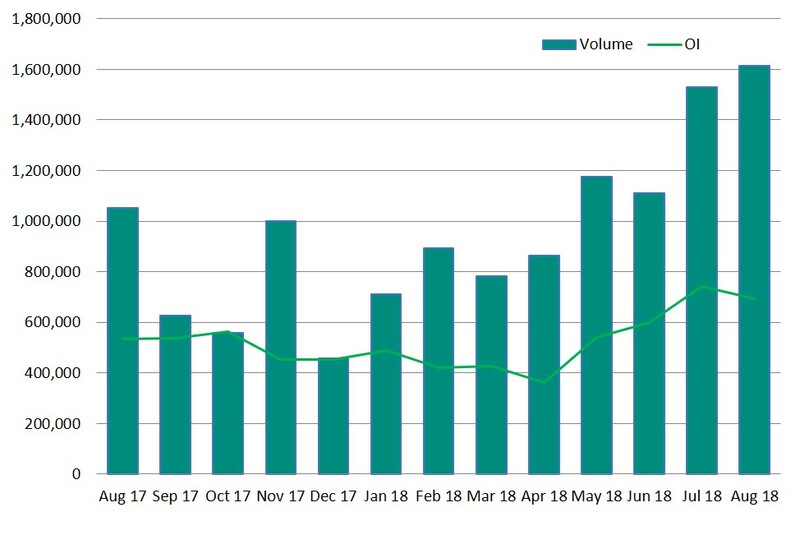 Average daily volume across our commodities market in July and August reached 84,113 contracts and 80,066 contracts, respectively, up 19.6% and 41% compared to July and August 2017. 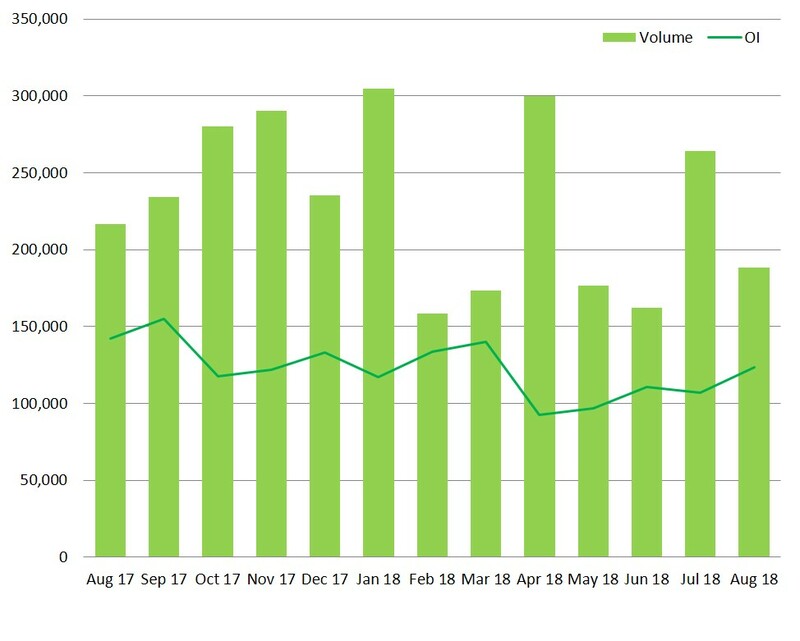 The high volumes demonstrate Europe’s position in the global wheat market, and prove Euronext’s Milling Wheat contract’s resilience as a benchmark for European wheat. We have been marking milestones in the rollout of our Euronext Inventory Management (EIM) service, with all our corn and wheat silos live on EIM from end August for the reception of digital storage certificates. The next big step will be in 2019 with the introduction of electronic warrants into the Euronext contract delivery mechanism, and we’ll continue to hold workshops to keep you up-to-date on how this will work. Read more about EIM in this issue. Meanwhile we continue to look at new ways to serve the European commodities markets, whether through introducing new references for the physical market, or innovating with new products. That includes our work to improve and enhance our existing products and services. Over the summer we held an extensive consultation on options in our Request for Cross service, and will implement changes in the coming months. Our IT teams are planning the next phase of the rollout of our new leading-edge Optiq trading technology to the commodity and financial derivatives markets. More in this issue. Read on for more information on our products and services, and as always, feel free to contact our team on commodities@euronext.com if you’d like to discuss them further. Euronext has announced additional delivery points for its Corn contract at Sica Nord in Northern France and Eurosilo in Belgium, from the November 2019 delivery month. Euronext’s Corn Futures Contract was launched in 1999 as an FOB Atlantic sea basis contract for export only, to deal with surplus crop. In 2006, the contract switched to delivery in silos (DAP) to match the needs of domestic users in the French market more closely. Trading flows have evolved over the years since the inception of the contract, due to changes in domestic usage and supply and demand. As the EU has expanded to include more countries, so the relevance of our contract has expanded to cover the EU market. Today, 60 million tonnes of corn is produced in the EU annually, but we import an additional 18 million tonnes on top of that. Euronext is continually working to ensure that our Corn Futures Contract can act as an effective hedging tool, with strong convergence for commercial market participants. In the current environment, this involves capturing import flows into the Northern EU, and demand from the feed manufacturing industry in the Benelux area. The price of the contract must reflect that of the Rhine and Danube physical markets, thus enabling it to be used as an accurate hedging mechanism for coops, trading houses, processors, starch industry and animal nutrition producers in these regions. In Euronext’s latest Corn Expert Committee meeting, the participants raised the idea of listing new delivery points in order to reflect the underlying EU corn markets more accurately. Following an extensive consultation, Euronext has announced new delivery points at Sica Nord in Dunkirk, Northern France, and Eurosilo, in Ghent, Belgium. These are now listed and available from November 2019 delivery month onwards. The first phase of Euronext Inventory Management (EIM) has progressed well, with our central counter party, LCH SA, using the EIM system along with our delivery silos and clearing members. The system is now used to produce digital storage certificates for commodity contract deliveries, including September’s Milling Wheat No. 2 delivery. This is the first stage in our plans to upgrade our contract delivery processes. We now enter the exciting period around the launch activities for the second phase of the system. This will see the system being extended to cover the production of electronically transferable warrants that give title to the underlying commodity. We believe this to be transformational for the industry, bringing advantages that have long been experienced in other industry sectors around helping physical traders, reducing credit risk and improving access to finance, as well as improving the efficiency of Euronext contract delivery processes. 13 – 15 Nov 2018, Global Grain conference in Geneva which will include a lunchtime ‘deep dive’ session around grain warrant financing and trading. Our innovative futures contract for nitrogen solution is available for trading for the European fertiliser market, with delivery in Rouen, France. Backed by partners across the fertiliser supply chain, from producers and traders, through storage terminal operators to cooperatives, Euronext’s UAN 30 Fertiliser Futures provide you with a comprehensive suite of tools to manage price risk and cover your overall positions more efficiently, for both agricultural inputs and for grains and oilseeds such as wheat, rapeseed and corn. Delivery is through Rouen-based Rubis Terminal, one of Europe’s leading independent storage specialists for fertiliser and agro, oil and chemical products. UAN 30 solution is a combination of urea and ammonium nitrate, a common element of the family of nitrogen-based fertilisers used throughout the agricultural industry. Clearing handled by LCH S.A.
"Rubis Terminal is delighted to team up with Euronext to launch this new contract. Our Rouen site is a major fertiliser supply and distribution platform for the agricultural sector and is ideally suited for the future success of this contract. We believe this initiative will make it easier for market players to access our offering and will confirm our position in Europe and worldwide." 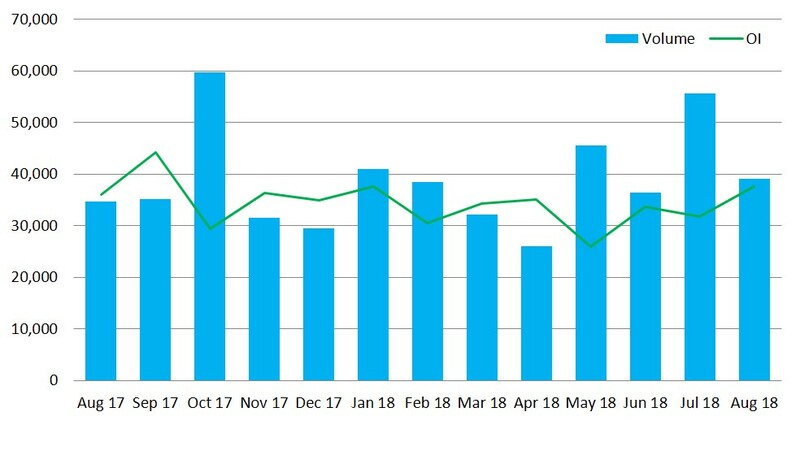 Since 25 April this year, Euronext has been publishing its weekly Commitment of Traders (CoT) reports online, showing the number of positions held per each MiFID II category and their weekly evolution. These reports, built in accordance with MiFID II principles and which meet different regulatory requirements to CTFC reports, show the breakdown between strategies, with a differentiation between ‘risk reducing’ and other strategies. To provide better accuracy in our CoT reports, Euronext encourages members to correctly flag their category using the dedicated field ‘Position Holder ID type’ in their daily file so that the sum of percentages of the total open interest reported equals 100% in the reports. Currently, if a participant has not flagged their category in their Position Holder File or in the field in their daily reporting file, the positions reported are not taken into account. Euronext relationship managers from the Corporate Sales Centre and Euronext Compliance teams are following up with participants to ensure they correctly report their positions. The reports have shown over the past months that, as expected, the Commodities market is primarily used for trading by professionals in the grain industry. For more information, contact your relationship manager at ccc@euronext.com, or email commodities@euronext.com. Our IT teams are planning the next phase of the rollout of our new leading-edge Optiq trading technology to the commodity and financial derivatives markets. This next-generation platform will replace the current Euronext Universal Trading Platform (UTP). Derivatives members were asked to provide their comments during a consultation in early September, and this will inform our decisions on the exact timetable for the rollout, the redesign of the access model to the trading platform, and the focus on core features for the derivatives market. The migration to Optiq, which is already in place for Euronext Cash Markets, will deliver improved performance and predictability and provide maximum flexibility with shorter time-to-market for new products and services. Let’s meet up! Euronext commodities representatives like to get out and talk to our customers across Europe and worldwide. We aim to be present at key industry events – in recent months we attended IDX 2018 in London, the Gafta London dinner, the IGC Grains Conference, and Agro Paris Bourse’s Bourse de la Rentrée in Paris, as well as the Grain Exchanges (Congrès des grains) in Lyon and in Nancy. Please get in touch on commodities@euronext.com if you’d like to meet up at any of these events to discuss our contracts.